On Thursday, March 7 boys at Shawano Community High School set forth on a new court. 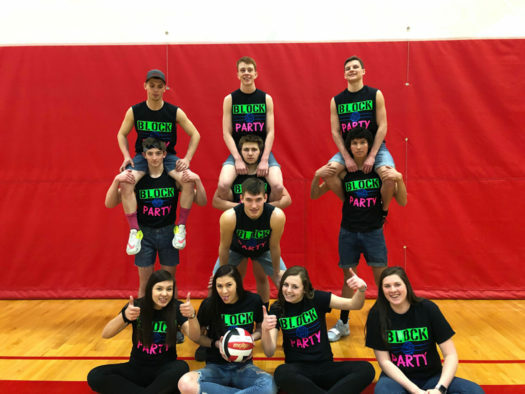 Boys throughout the entire high school, ranging from freshmen to seniors, competed against each other for bragging rights as volleyball champs, while also impressing their peers. The Powderbuff competition had 9 teams, and a lot of the teams were very confident and focused on giving it their all to put on a good show and win the competition. As the competition began, the stands filled up with students that were not participating as well as parents coming to cheer on their kids. The competition was a great opportunity for students to relax, have fun and blow off steam in a positive way. One of the senior teams consisting of Hunter Calkins, Alex Sumnicht, Jake and Nick Grignon, and others had high hopes but fell short early on in the competition. Although they lost their first game, they do not regret playing and say it was a fun experience. Their coaches were Emily Bastar, Julia Klement and Bayleigh Laabs. Many of the teams stated that they would have liked a little trophy so they could take pictures after the games and to increase their ability to show who was victorious. Teams were allowed a number of players, but it was unclear as to whether having more or less team members was the most beneficial. Some teams felt that the more players they had the better, because they could get more rotations and have fresh people in the game at all times. On the other hand, some teams thought having the bare minimum to fill the court was the way to go, so they could find who has the best team chemistry and put players in their strongest positions. To play in this competition teams needed to be on their a-game, because any mistakes could lead to the team losing the game. Players and coaches had many things they did before their games so they could get ready. These all got them ready for their debut on the court to either advance or be eliminated from the winning bracket. Students of all grades who participated in this event seemed to thoroughly enjoy themselves. It was truly a great opportunity for friends to get active together and take a break from studying. Both parents and players hope to see more enriching activities like this in the future. The 2019 Powderbuff Volleyball Tournament was an impressive day where students and parents came together and enjoyed a healthy activity in a safe environment. It was a day filled with friendly competition, determination and teamwork.